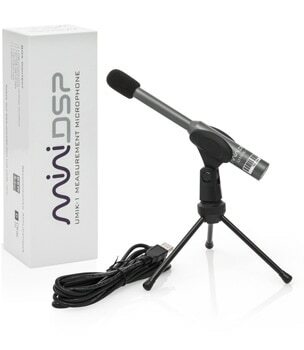 The miniDSP UMIK-1 is the perfect companion to audio analysis programs running on your tablet or even your smartphone. In this application note we will show you how to set up your UMIK-1 with the SignalScope Pro app from Faber Acoustical, running on an Apple iPad. SignalScope Pro is able to set level and frequency response readings (FFT only) from the UMIK-1 calibration data. Please note: miniDSP cannot provide support for third-party applications or hardware. This app note shows you how to set up the miniDSP UMIK-1 to use with SignalScope Pro but other functions of the Apple iPad or the SignalScope Pro app are beyond the scope of miniDSP support. To generate audio output from the iPad, connect a cable from the iPad headphone socket to the system being tested. On the iPad end, the cable will have a 3.5mm stereo jack, and typically the other end has a pair of RCA connectors, as shown at left in the photograph below. Alternatively, use a 3.5mm stereo to RCA adapter, as shown at right. If you haven't already, install the SignalScope Pro program on your iPad from the App Store. Enter your microphone's serial number and press OK. SignalScope Pro will fetch the calibration file from the miniDSP website and load the calibration data. Each microphone has a unique calibration file, which is why the serial number must be entered. Tap on Sig Gen at the bottom of the screen. You can experiment with the different types of test signal here. For now, set it as shown below, adjusting the volume so that it plays through the system at a comfortable level. Ensure that the signal generator is enabled at the top right, and turn signal generation on and off with Play/Pause button (next to the Headphones label at the top left. Adjust the level with the iPad volume control and the Noise Amplitude slider, and use the Noise Pan control to send output to only one speaker. The Options screen can be used to set options, such as octave or third-octave display, frequency weighting, response time, and whether or not the display scales automatically. Note: the distortion components may include distortion from the microphone, so take care in interpreting these results.